I’m back over on the MFT blog again today – this time with a couple Brusho projects! Any science fans out there?? I’m Sandy Allnock and it’s time for a little confession. When I was in school, I loved the idea of science. I loved all the pretty beakers, and all the things to mix in them, watch them bubble and broil. But I couldn’t get past the way the science lab smelled! Okay okay, for you scientists, that might be your love, or I might have just had fellow students who liked to mix up stinky things! But today I bring you science that makes the artist in me happy. Are you ready? I’ve made two cards today, one using leftover parts from the other – don’t waste those bits! And in the video, I’ll show you a couple different ways to apply your watercolor powders to your work. 1) Dropping powder into pools of water; 2) Picking up brusho from a palette or work surface; and 3) Spritzing with water! Watch the video below, or click HERE to see it in HD on YouTube! 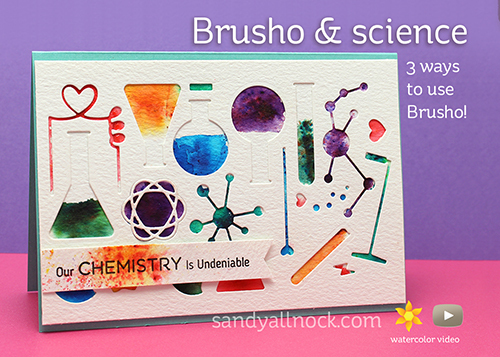 There are a couple different brands of watercolor powders – after playing with different ones, my favorite is Brusho. I love my little caps I made for them too – you can see more on that HERE, as well as some differences between different ones. 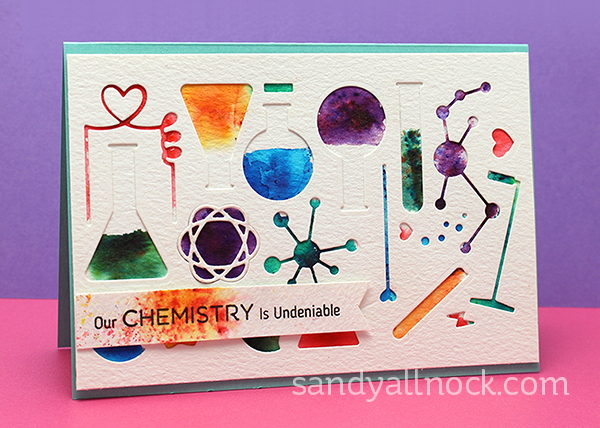 The first card came out so cute using just the dies – before cutting anything apart! Lots of times the dies are set up so that verticals are vertical, or there are interesting patterns they can create. When you get a new set, think about it before getting out your snipping tools! And if one part of the die set looks odd – like the “insides” of the beakers in the lower left here – just put your sentiment panel there. Easy peasy! The little Pure Innocence stamps are so much fun to color – and I used similar techniques for her as for the background above. Just dropping watercolor powder into wet areas, and drying them in between. 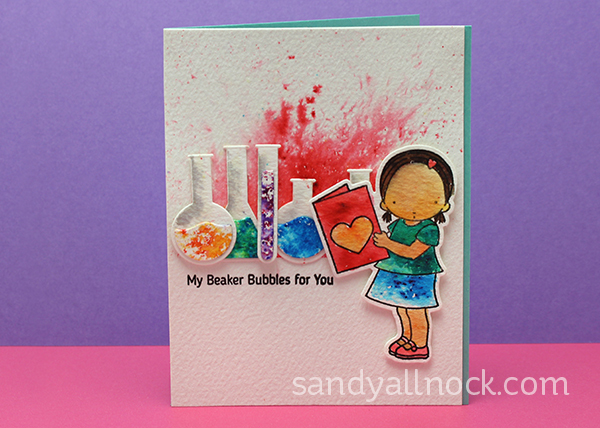 For the background for card two, a spritz of water and sprinkle of powder made that fun cloud of bubbling beakers! 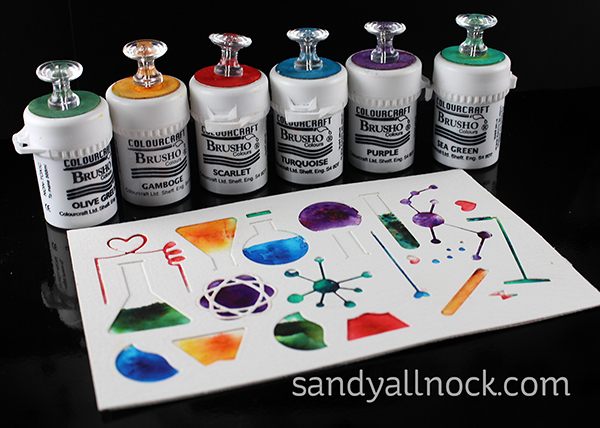 And to color those little “contents” for the beakers was easy too – spritz and sprinkle! The watercolor powders work on other watercolor papers, but I love how nicely they move on the Arches Rough Cold Press – it’s got a texture that pushes color in fun ways! On my blog today I’ve got a playlist of more Brusho videos if the product intrigues you. WARNING: It’s highly addictive! I thought today I’d provide a few Brusho resources for you guys too…. Hey Sandy – I just love watching your video and am learning so much. I was curious as to what Ellen Hutson metal sheet you are using. I have looked on her site and can’t locate it. Would you mind sending me a link? Thanks again. You ma’am are a drug dealer. I didn’t get THIS set of MFT stamps (one of the few I didn’t), but the sentiment rocks as does the dies. Sigh. Ordered those. THEN ordered the darn Brusho 24 set. DRUG. DEALER. Yes, you are. Love this video. So many different ways to put to use the different steps you demonstrated. Looking at some of my dies in whole new way! Many thanks! Such fun! My husband teachers chem labs so this would be perfect for him! I absolutely LOVE this card Sandy!!! I’m loving these powder watercolors and you just inspired me to use mine today! A great controlled way for brusho,I also have to give props to the brushes.I broke down 2weeks ago and finally bought the 2,4,and 6 Silver brushes.I can’t thank you enough for recommending them.A huge game changer for WATERCOLORING IN MY WORLD.Great to learn from you daily.Thank you for all you do Sandy.Its priceless to me.BLESSED Day. Love the colors. Enjoying you using MFT products too. As always, thanks for all you share. 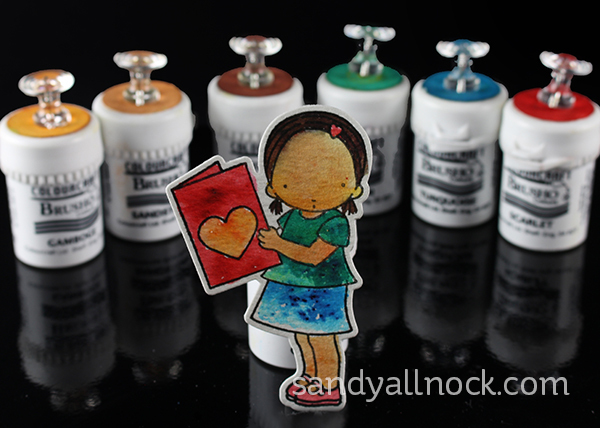 Love what you’re doing with the MFT stamps – so unique! Great color choices (as usual!). I do enjoy using Brusho for backgrounds and such. Thanks Sandy!